Hello Fabricworms! For all of you who have been big fans of Monaluna's Circa collections, we have just the best news for you. 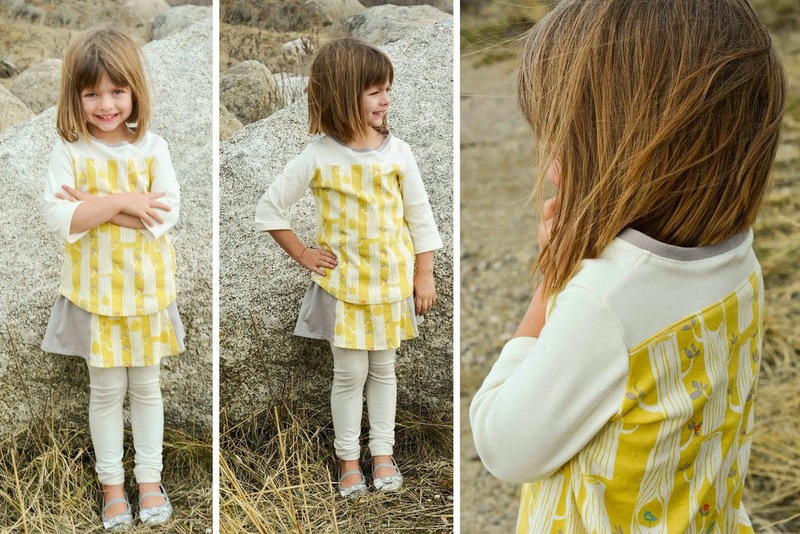 First, the newest collection of Circa 52 is finally in stock! Second, It is this week's giveaway! Winner gets to decide which Poplin print they would like. Enter to win one of these adorable prints now! Need some inspiration? Here are a few ideas of what you could make with this fabulous collection! Although these next few projects feature Circa 52 in Knit, they are still a great source of inspiration to get your creative juices going! This giveaway ends on Sunday 2/22 @ 12 am PST. The winner will be contacted shortly after by email. The winner will be chosen randomly by Gleam. I have been dying for a new zip front hoodie with my own pocket modifications, and some pretty red organic cotton fleece would be just perfect to make it with! I have never seen with fleece but cotton fleece is intriguing. I would probably make a hoodie for one of my grandchildren. Probably a natural or a gray would be my pic. Baby blankets would be a great project to use it in. I would love to win this giveaway - I have so many things I could make with this fabric! Oh how I love nature scene fabrics!! I would make my daughter a spring dress! I would love this! Great fabric for my little one. Love the rocket ship print. Teal lounge pants in fleece and nursery decor in the woodland party! I would make a quilt with this beautiful fabrics! And my favorite color of fleece is blue. Perfect for a new baby quilt! Lately I am in love with soft tones and grays! Making Baby Quilts - would be PERFECT! 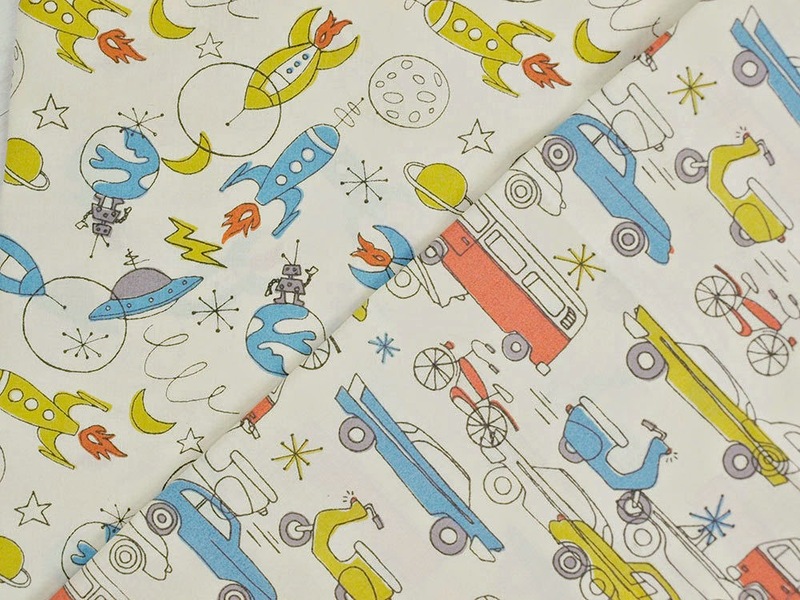 Adorable retro fabric to make a baby quilt with! I would make some pillows and a quilt... I love this fabric! I would add it to the quilted baby blanket I am making for my adorable newborn nephew! Loving the pennant flags/owl fabric! I love the trees and rockets. I would make a baby blanket for sure. Love you site! Most probably would make a sweatshirt in red! I'd make a baby quilt! I'd make a hoodie in blue! Gorgeous prints! I would like to make something for my two-year-old...just so much fun sewing for little girls. And so many options! Well, a skirt is always good!!! But we love making bags and quilts and stuff! Love this! Would love to make my little guy something great! I adore the colorways on these fabrics! I don't know what I'd do with them, yet. Thanks for introducing me to this line! 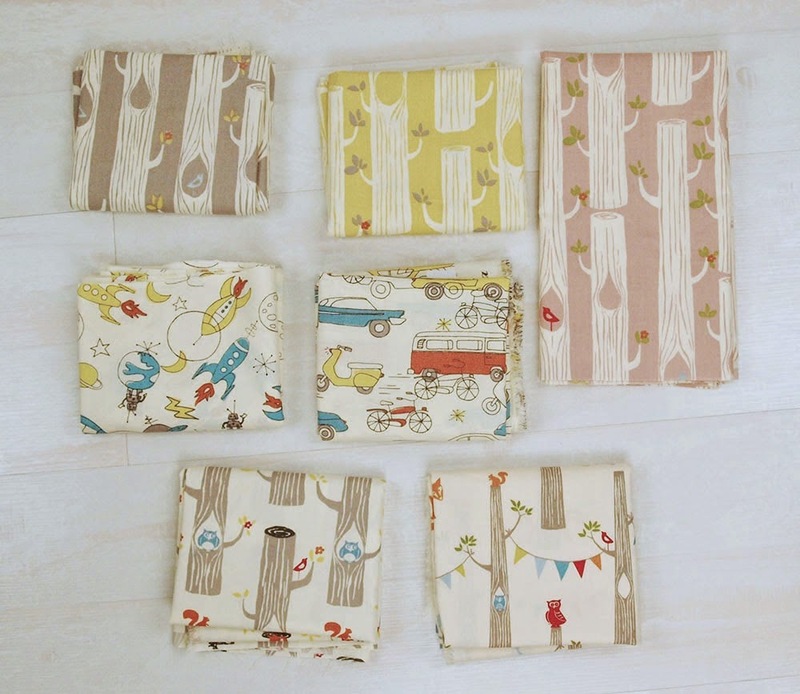 Those are such cute prints-great for baby blankets, pillowcases for the little ones too! I like a sky blue fleece! I'd make a pair of pjs for my five-year-old grandson. This is such a sweet collection. I would like to make pj pants for the grandsons. A crib sheet - love these fabrics! Love this! I'm looking for cute fabrics for a baby quilt. love the fabric would love to use for baby quilt! I would make some pillows with the rocket fabric. Very nice. Thanks for the giveaway. Jams, bags, quilt. I would make an adorable quilt. I'd make something for our new baby and definitely use some turquoise fleece! These are so sweet! Thanks for a chance to win. With 2 beautiful yards of fabric, I'd make a sweet baby blanket to hold my first grandchild in. My favorite color of fleece is any shade of purple! Love these prints! So many ideas!!! I love this fabric and can't wait to get some. I love these fabrics and what a treat for the winner to get to select their favorites for the prize. I can picture using them in lots of different projects. Love this fabric. 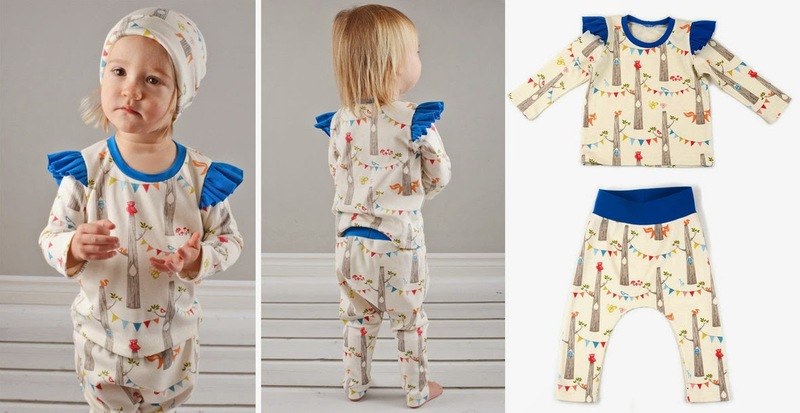 I will make jammies for both my boy and girl. That would be fun! Getting quickly addicted to fabric, and this would look so sweet in my stash! I do love me some rockets!! That would make an awesome start to a quilt for my newest nephew! 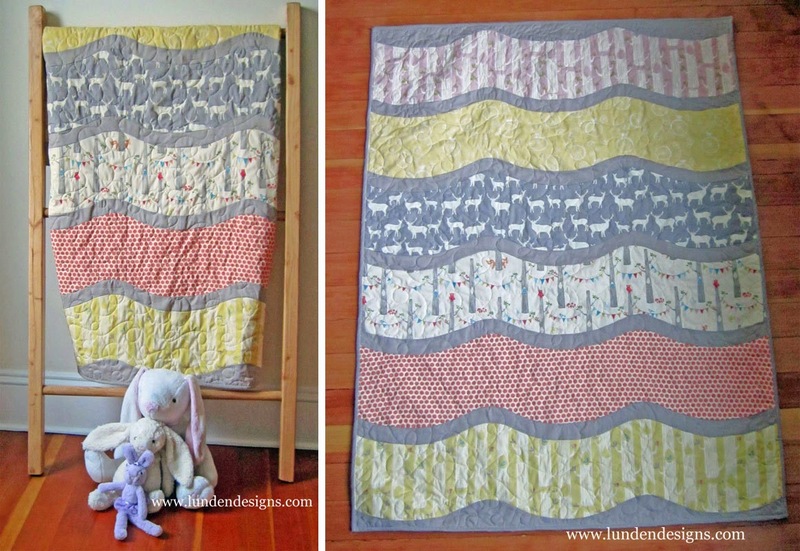 A nice snugly toddlers quilt. I'm a fan of gray and greens. Oh my, so hard to choose! A baby boy's quilt. I would make a blanket for my littlest. He hasn't gotten one from me yet! Almost too cute to cut into...almost. Love the party in the forest- would love to win two yards! Pajamas and my favorite color is pink. Thanks for hosting the giveaway, hope I get the chance to win! I'd make some hats and scarves, and I love green! These fabrics are just the right stuff for the quilt I will be making for my tree-hugging grandson; he just loves everything woodsy! For fleece-pj pants!! Lime green!! I have baby gifts in mind for the poplin!! Id make a cuddly quilt, after I got through petting and admiring it. I love the print with cars on it. Just adorbs!! Can't get enough of this new fabric! Thanks for the give away! That rocket ship print is gorgeous! I only have girls but I would have to make a retro dress for them out of that. I would make something for my son, some shorts? I'd make a quilt. I love any shade of purple! Laura - I would love to create a baby-quilt. I love the red and yellow fleece. I would make some bags, like clutches. PJ's, my grand daughters are getting real good on them. Thanks. Definately pyjamas, in a berry red. I love this for baby blankets, PJs or maybe some curtains for my kid's room. I would be inspired once the fabric was in my hand. any color fleece I COULDN'T PICK A FAV. lOVE IT ALL! So lovely! It would be hard to choose! I love the print with the VW van. Not sure what project I would make yet. These are all super super cute!! ThIs collection is soooo sweet!!! Cute fabrics! Thank you for the giveaway opportunity! I love the collection colors. so cute and serene, it makes me feel like sketching or painting sceneries of cute things that make you laugh or cry or want to do both. I would love to make my nieces some lounge pants! Perfect for my son's fort! Lovely, warm fabrics! They would make a nice addition to any nursery. I'd make a baby quilt for my friend's first grandchild due in two months. Love the color blue. I would make a nightgown for my little granddaughter. My favourite colour of fleece is aqua.